We have witnessed that in the last few years, obesity is often referred to, and it’s increasing presence among the population, particularly in children. The main reason for this is too much sitting, unnecessary overeating and complete lack of physical activity. Natural teas for weight loss, which will be discussed in this article can cope with being overweight, but only if you are physically active and if you change your diet. Obesity causes a whole range of health problems, ranging from cardiovascular disorders, high cholesterol, diabetes and other diseases of our time. Obese people often have problems with varicose veins, swollen joints, bending of the spine, bursting the capillaries and irregular bowel movements. Also, more often they suffer from several types of cancer. The best teas for weight loss will improve the work of your intestines, liver and kidneys and will help you to remove fat from your waist and you will feel a lot better. More below. Why should we drink natural herbal teas? Tea for weight loss helps burn fat faster and prevents bloating and fermentation, cleans the body of toxins and eliminates the accumulated liquid. In addition, it stimulates the metabolism and accelerates the digestion, which is the key in the fight against being overweight, and is recommended for people suffering from chronic constipation. In addition to representing a pleasant habit that breaks the daily routine and relieves stress, sipping tea allows you to enter into the body active ingredients of herbs that contribute to the melting of fat deposits around the waist. Specifically, these compounds enhance the function of the liver and kidneys, boost metabolism, while also alleviating the general inflammation of the body, which is an obstacle to losing weight. Drinking tea promotes hydration, but also fills the stomach. Teas for weight loss alone do not contain a lot of calories, they are safe for drinking. Their biggest advantage is that they keep you full throughout the day, eliminate the unpleasant feeling of hunger and hence your need for food will be less. Correction of your diet is inevitable, as well as daily physical activity to achieve the desired results. How to make a good tea mixture? Whether it comes to Odvárka (flowers and leaves of plants in the boiling water) or essences (cook the hardest parts of the plant, i.e., seed and root), the more enjoyable the herbal tea will be- try to drink it without sugar (you can add to it a little stevia). Related: Green tea eliminates extra pounds. We present you the teas that you can drink after a heavy meal, during stressful afternoon, or in the morning, before breakfast - if you want to increase the effect of detoxification. How do you make the best tea for fatty liver? It is a drink of burdock (plant good for the liver), ash (it acts as a diuretic and anti-inflammatory, and cures fatigue) and bitter orange (increases thermogenesis). Make a mixture of 30 g of leaves of burdock, 30 g of leaves of ash and 20 g of bark or flowers of bitter orange. Put 200 ml of water to boil, add two tablespoons of this mixture and let it cook for five minutes. Turn off the oven, allow it to stand for five minutes in a covered pan, strain and drink. Natural teas for weight loss are very effective for eliminating stress in tense conditions. Therefore, if you notice that in stressful situations and after strenuous daily tasks, you instinctively get the desire to eat something - choose tea of ​​Siberian ginseng. It is an adaptogenic herb that enhances our response to stress. Take 20 g of root of Siberian ginseng and add 20 g of flowers and orange peel, as much as lemon balm leaves and flower of Christ. In 250 ml of water put a teaspoon of this mixture and let it cook for 10 minutes. Once it sits for five minutes, strain and drink. When you overdo it with sweets, make a mild herbal tea with hypoglycaemic effect that in addition to the successful elimination of excess weight, speeds and betters digestion. Overall, herbal teas for weight loss are much more effective if you drink them on an empty stomach or immediately in the morning, so apply this rule. If sugars increase the fatty deposits on the stomach, their dissolution enhances renal function and helps absorb less sugar. Some studies have shown that more fluid can reduce the risk of developing diabetes. Birch, nettle, orthosiphon and lime (20 g of each plant). To this mixture add 10 g of fruits of green anise, 10g of mint leaves. Put a spoonful of this mixture in a cup of boiling water and leave it to stand for five minutes. Strain and drink in the morning and evening. To start a slow metabolism, make bold tea (South American woody aromatic plant) and Helichrysum. This herb improves liver, intestines and kidneys, and thereby holds the blood sugar levels under control. Add hot pepper to it, known for having a warm effect and stimulates lipolysis. Take a teaspoon of mixture you made from 20 g of Bold leaves and the same number of Helichrysum leaves, and put it into boiling water and let it cook a few minutes. Then add a little ground pepper or a piece of dried fruit. Drink after main meals. Tea for weight loss, which includes Helichrysum is known around the world, they help reduce weight easier and reduce the inflammatory processes in the body. For immediate effect use ginger and cinnamon root. Tea for weight loss, which includes these two plants directly affects the fat around the waist and works effectively on all causes of this problem. Ginger (cleans the body and dissolves fat), cinnamon (lowers blood sugar) and coriander seeds (prevent fermentation) and hibiscus (has a refreshing effect). Mix 20 g of each essence, and a teaspoon of this mixture put in a cup of boiling water. Allow it to cook for five minutes, strain and drink between meals. Using ginger will solve the excess fat problem, while cinnamon lowers blood sugar. Herbal teas for weight loss can help remove toxins after eating too much. 30 g of fresh ginger, chop it into rings, 20 g of crushed cinnamon, 20 g of raspberry leaves and as many leaves of mallow, which prevents stomach bloating. Place a spoonful of the mixture in 250 ml of water and boil for ten minutes. Then strain it well and drink immediately. At the celebrations we always eat and drink too much. Use plants that have depurating and detoxifying effect, in addition to promoting better digestion. As soon as you return home, take this medicinal tea, experiences with these drinks are very good. When the intestines are not working well due to excess sugar (which alters the intestinal flora) or improper diet, usually the result is stomach bloating. The sense of weight and constipation will only slow down weight loss. 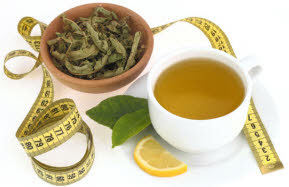 Natural teas for weight loss can relieve existing problems. Make a mixture out of 10 g of cumin seeds, fennel seeds, and anise seeds and 15 g of mint leaves. Take a teaspoon of this mixture and pour it into a cup of boiling water. Leave it to cook for five minutes, strain and drink after a meals. These beneficial seeds have a carminative effect and prevent fermentation and meteorism (gas in the stomach and intestines). Cumin helps for faster weight loss. What to do if hunger bothers you at night? As explained below, you should avoid eating after nine o'clock in the evening. If hunger strikes after dinner, it is better to make yourself a hot drink. Tea for weight loss will reduce appetite and fluid will fill the stomach. If you include cocoa in the tea which is responsible for the entry of tryptophan in the body, the brain will be satisfied, and the real reason for hunger in the late hours will disappear. Put a teaspoon of bitter cocoa, a little ginger powder, cardamom seeds from the berries and cinnamon in 250 ml of boiling water. Let it stand for five minutes, strain and drink. The experiences with these natural drink are excellent. We believe that natural teas for weight loss will contribute to your good health in general. If you have existing problems or want to solve the problem of excess weight, it is essential to previously consult with a physician.